Bad Taste Bears are the creation of illustrator and graphic designer Peter Underhill. The idea for the range came about in 1994 when he was designing a range of cute bears to be printed onto little girls pyjamas. “I was all ‘cuted out’. So, I drew ‘Hey kiddies, here’s the chainsaw bear’ as a refreshing change and enjoyed it so much that I began putting a list together and started drawing and painting bears in ‘interesting’ situations as a release for my twisted imagination”. After Chainsaw Bear, ideas came quickly and there soon followed many more bears including ‘Incontinent Bear’ and ‘Brains on the ceiling bear’. The traditional bear had been given a brand new very much adult themed angle. The range were turned into figurines in 1999 by Piranha Studios, and the first six figures were initially distributed for sale in the Gadget Shop. The Bad Taste Bears were an instant success and within the first year, the range increased to twelve figurines. The collectors club was launched soon after. The range is very much based on humour, tongue-in-cheek, and innuendo. Some pieces definately have shock value, but they have raised a lot of interest and have been one of the fastest growing collectables for the past few years. Some of the early pieces which were sold at £10 have been sold at auction for over £500. The Bad Taste Bears club keeps members up to date with the latest news, and receive a number of gifts including Bad Taste Bears notepad and wallchart. 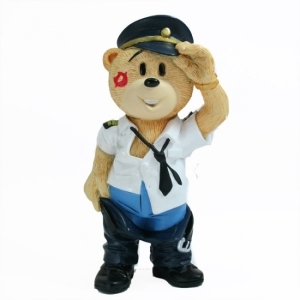 Members also have the opportunity to purchase members only gifts which include Malcom and his Amazing Box of Tricks the 2012 Members Only Clubber Bear. For 2013/14 the club gift is the Mile High Club.